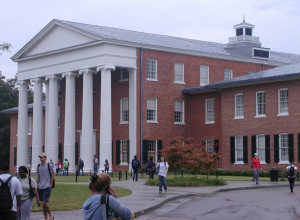 The main campus of The University of Mississippi comprises 640 acres and is within easy walking distance of downtown Oxford. Since first opening its doors in 1848 to 80 students, University enrollment has grown to more than 14,000 at the main Oxford campus, the Medical Center in Jackson, and the Tupelo and Southaven campuses. Most importantly, Ole Miss has achieved true international recognition for its blending of scholarship and research, public service, and athletic success. As comprehensive state institution with 500 faculty, the University offers degrees in all branches of the arts and sciences, law, pharmacy, business, accountancy, and education, including graduate degrees in more than 20 fields of specialization. Combining an over 150-year-old tradition of academic excellence with the latest in technology for research and classroom instruction, The University of Mississippi offers the best of the past and the future. Performing Arts. The J.D. Williams Library has more than 1 million volumes and includes the largest blues collection in the world. Among other sources of pride for the University are international award-winning choirs, the Center for the Study of Southern Culture, and the National Center for Natural Products Research. Another special source of pride for the Department of Physics is the Millington-Barnard Collection of pre-Civil War-era physics research and demonstration equipment. One of the finest collections of its kind in America, it is housed in the physics department and the University Museums. Oxford, Mississippi, is a beautiful Southern town, complete with oak-lined streets, a picturesque town square, and large antebellum and Victorian homes. The town is located only 75 miles southeast of Memphis, Tennessee, a major distribution and transportation hub for much of the Southeast. Oxford was the home of the late Nobel Prize-winning author William Faulkner, who based his mythical accounts of Yoknapatawpha County on stories gleaned from his lifetime observation of the town and region. His home, Rowan Oak, and surrounding property have been restored to preserve them as they were when he lived there, and one can still feel in them a sense of quiet refuge from an encroaching world. More recently Oxford has been home to novelist John Grisham. finest independent bookstores in the nation, experience the best in old-fashioned service at the oldest store in the South, and enjoy cuisine ranging from shrimp and grits to sushi. Oxford has been called a “thriving New South arts mecca” by USA Today and appeared in the New York Times Travel section. We have compiled a set of links to community information.